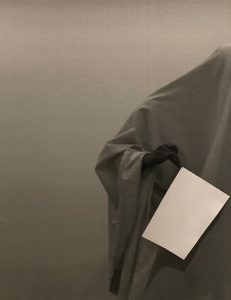 Brian Fuata’s 2018 Fisher’s Ghost Art Award winning work Care Disfigurements (Soft Hands) features a “blank sheet’’ upon which the body becomes a text. This has been a recurring motif across his varying practices, transforming in different contexts from emails, to paper, Word.Doc, google.doc, to film, to a white bed sheet for the Sydney artist’s ghost improvisations. He certainly impressed this year’s judges of Fisher’s Ghost art award. “Brian’s work is considered and compelling and a fantastic extension of his performative Ghost series,’’ said one of the judges,’’ Mikala Tai. Tony Albert and Fiona Davies were the other two judges on this year’s panel. “Care Disfigurements (Soft Hands) is a bracket of my ghost structured-improvisations loosely centred around multiple contexts of care,” the artist said after being named this year’s Open winner. 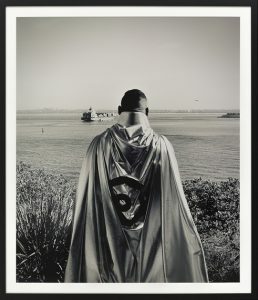 The 2018 Fisher’s Ghost Art Award received a record number of entries, 1,126 all up. “We’re thrilled to be celebrating the largest Fisher’s Ghost Art Award to date in 2018 which also marks Campbelltown Arts Centre’s 30th anniversary,’’ says Michael Dagostino, Campbelltown arts centre director. “We received entries from artists far and wide and it’s wonderful to see such a fantastic display of works from a diverse range of artistic practices,’’ he said. “Congratulations to the Open Award winner, Brian Fuata and all the category winners. The 2018 Fisher’s Ghost Art Award exhibition continues until December 13 in the arts centre. Entry is free. Dennis Golding’s winning entry in the Aboriginal art category. 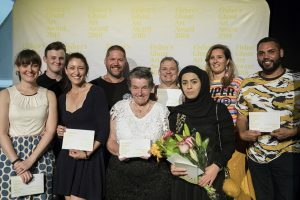 And the 2018 winners are: (left to right) Valentina Schulte – photography, Shane Hobday – secondary, Sarah Frost – surrealism, Andrew Vanderschoor -traditional, Rhonda Banks – Macarthur, Peter Gregson – Macability, Asmaa Balat – secondary, Rosie Deacon – sculpture, Dennis Golding – Aboriginal art.